Bring the beauty and class of a jewel to your outdoor space with the La Jolla Fire Pit. Made from Steel with a Copper Vein Powder Coat finish and handcrafted in the USA. Powder coated steel offers a strong resistance to rusting, cracking, chipping, peeling, and scratching allowing it to maintain its signature sleek appearance for many years with little to no maintenance. Use the included Lava Rock or upgrade to a beautiful selection of Fire Glass. If upgrading to Fire Glass, 25 pounds is recommended. 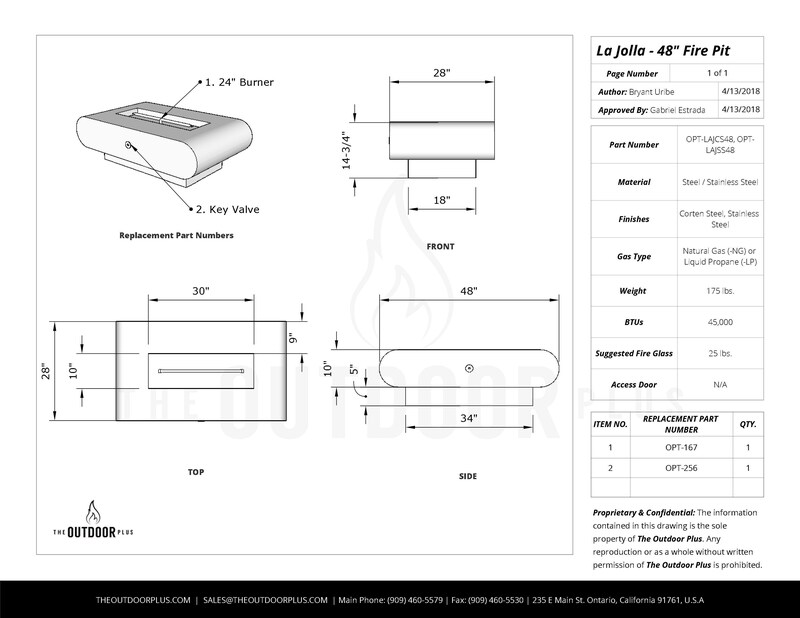 The 304 Stainless Steel burner produces a maximum 45,000 BTUs. Key valve accepts half inch male fitting hose. This Steel Fire Pit has a surrounding area of 48 W x 28 D x 15 H with a burning area of 30 W x 10 D x 2 H. Burner pan features multiple drainage holes for proper water runoff. This unit features match light ignition. The Outdoor Plus warrants their fire pits against manufacturing defects that prevent safe and correct function in residential application for one (1) year for electronics, gas valves, and pilot assembly. Stainless steel pans, fire rings, and valve boxes are covered in residential application for three (3) years. For commercial application, electronics, gas valves, and pilot assemblies are warrantied for six (6) months, while stainless steel pans, fire rings, and valve boxes are covered for one (1) year. Must be installed by a local licensed Plumber or Gas Company Agent.